Convert ACT! iml, aml, and ACT! Emails Databases to Outlook! The email To and From recipients are maintained. All text in the email is maintained. All HTML text (if any) is maintained. All attachments in the email are converted as well. If the attachment is a .iml or .ima file, that file gets converted as well. Our goal is to convert the email in such a way that any ACT! dependencies are removed and all you need is Outlook. In addition, all the addressing information such as From and To and CC information are converted as well. Basically, the email will look as if it was sent from Outlook. "Tom, thank you for the great email conversion that you did for us. I couldn't believe it when I opened the email and all the attachments had been converted as well! Again, thank you. "You guys did it! All the emails came over into Outlook, including the directory structure. Awesome. Find out the total number of emails you want converted. ACT! Internet Email: right click on the properties for the Internet Email Folder and it will state the total number of emails in the folder. ACT! SQL Email Database: If you don't know the number of emails, just send us the data and we can look at the database and tell you the total number of emails that need to be converted. ACT! 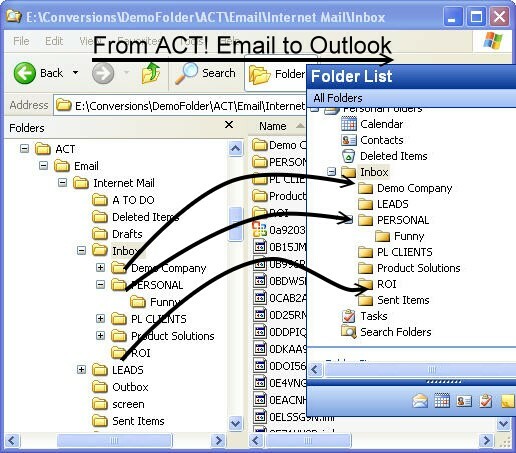 Emails Attachments: right click on the properties option for the attachments folder and the total number of emails/files is then listed. If you do not know how to perform the functions above, then just copy the emails into a zip file and send it to us. Make sure you contact us first for the address to sent the data to. Purchase the conversion from the button below and instructions are sent to you on how to provide us with your Emails in a .zip file. Send us your Emails in a .zip file. This is either done via upload (if .zip is less than 1GB) or via snail mail/Fedex/UPS if the zip file is larger than 1GB. The US address to send it to is in the email that we send you. Download the converted emails. If the resulting conversion is less that 1GB, we will send you download instructions. However, if the conversion is larger than 1GB, we'll send you a DVD with all the data.